Because Good Food is Better Shared: A food blog for those who know we are what we eat. And a travel blog for those who know that wherever we go, there we are. Day 10 of a 20 day cruise for us, docked in Marseille. Some people who have had their 10, 20, 30 or whatever days already are leaving the ship here. Others are embarking for their own cruises of varying durations. Mean of me, but I am hoping the families of the bratty little kids are going. It’s been really interesting to me to think over the rhythm of our days here. I wasn’t sure this would be the case since I wasn’t nuts about our first cruise but this time around I really, absolutely, head-over-heels love cruising. What’s different? For one thing, we start every day working out so I feel invigorated and better about lazing the rest of the day and eating more than I usually do. The fitness facilities and spa are really first rate and it’s fun. Also, the food is really, really terrific. Fresh, delicious, and lots of changing fish and vegetarian options. 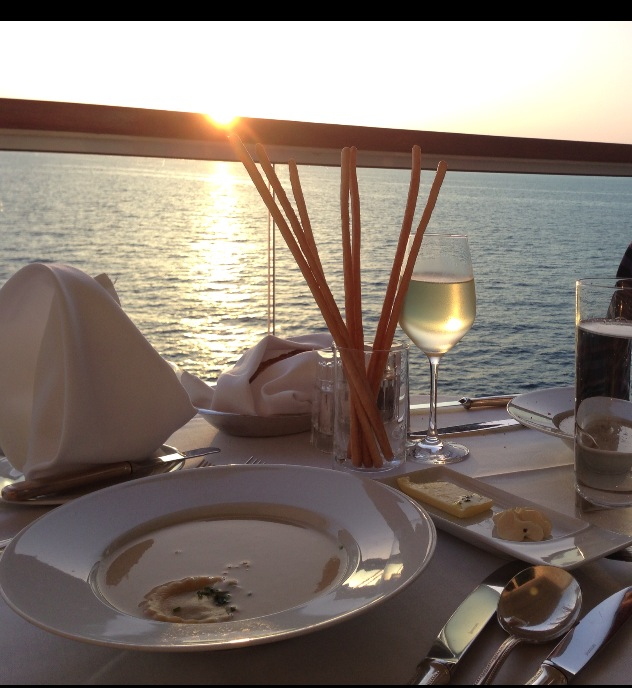 We have eaten in all the restaurants except the Restaurant 2, the tasting restaurant, which we will go to next Saturday. The food is great everywhere. Even at the Patio Grill by the pool the fish is perfectly cooked and I hear the burgers are perfect. I don’t care for the main restaurant (called the Restaurant) — it is cavernous and not at all intimate or inviting — but the food there is great and it’s available through room service. And the Colonnade, with its tables on the deck, is just lovely. We have breakfast there everyday, and sometimes lunch and dinner too, depending on what’s on the menu. 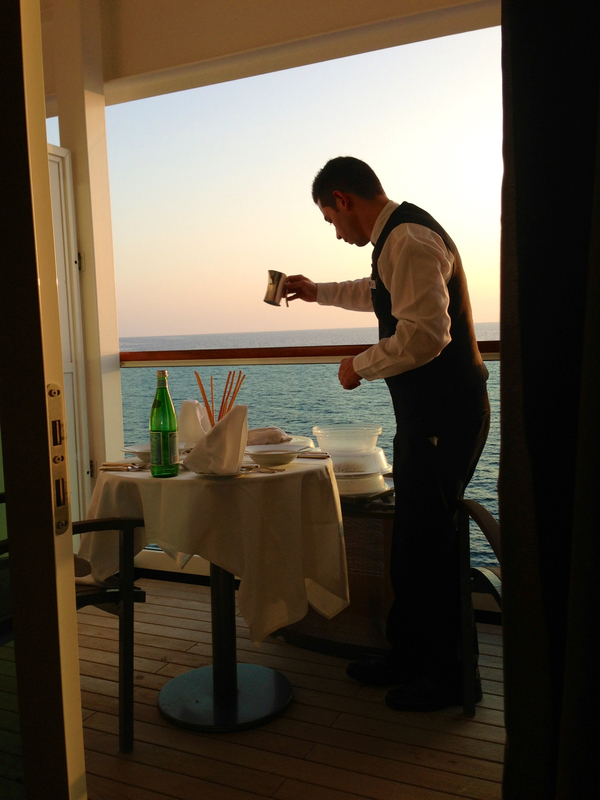 Best of all, on the Seabourn Quest our balcony is bigger and we spend lots of time on it, which is just idyllic. Four of the last ten evenings we have eaten on our veranda because it is so tranquil and the view cannot be beat. They bring up tablecloths and silver and set the same elegant table you ‘d have in the restaurants. All the courses, wine, water, bread, they bring it all in. You eat in a drop dead gorgeous setting with complete privacy. And then they come and clean it all up. What is not to love about that? Really, I think it was important for me to get my head around the fact that just because there is always something to do on the ship , it doesn’t mean I have to do it. I am not a drinking, partying, cabaret-going, slot machine playing kind of girl. This cruise line is less oriented to that kind of thing than most, but there are still all kinds of activities and plenty of people who are really into it. For the most part, I just don’t care. I really like spending time with Jer, sunning a bit, reading a lot, tasting new food and keeping the blog. And watching the water. That, to me, is what this cruise is about. Visiting interesting places (when I feel like it), hearing interesting lectures (when I feel like it), seeing a show (when I feel like it), getting dressed up (when I feel like it) — that is all great. But the water is everywhere and I can watch it and listen to it wherever I go and it soothes me to the core. They leave cruise catalogues in your room (and all over the ship) and encourage you to make a deposit on a future cruise before you leave to secure a discount, so naturally I have been browsing through the possibilities. My fantasy is that we sell a million textbooks or sell our Bloomington property to Holiday Inn for big bucks and take a 116 day world cruise. Check it out — Los Angeles to Hawaii, across the equator, French Polynesia, New Zealand, Australia, Indonesia, Malaysia, Hong Kong, Vietnam, Thailand, Singapore, Sri Lanka, India, Egypt, Jordan, Israel, Greece, Croatia, Italy. I could sooooo get used to that.